Can India Juggle Partnerships With US And China? The Trump Administration’s wooing of India to contain China’s growing political, economic and military might in the Indo-Pacific was on full display last week as the two countries deepened strategic and defence ties. The first meeting of the new 2+2 format — between External Affairs Minister Sushma Swaraj and US Secretary of State Mike Pompeo and Defence Minister Nirmala Sitharaman with her counterpart Defence Secretary James Mattis — finally took off after two earlier postponements. Going by the smiles and the relaxed body language of the four ministers, the talks went off well. As anticipated, India and the US, signed the Communications, Compatibility, Security Agreement or as it is commonly called the COMCASA. This is a defence agreement which allows India to access encrypted technology from the US. It will lead to better operational co-operation between the defence forces of the two nations. For India-US defence ties to work, India has to sign three foundation agreements which will allow it to get US military technology. Defence experts say that COMCASA is necessary for the combat version of the Sea Guardian drones that India is keen on acquiring from the US, since these operate on a secure data and communication system link. Of the three foundation exchanges, two have already been signed now with COMCASA…This will leave only the Basic Exchange and Cooperation Agreement (BECA) to be worked out. In addition a fourth agreement, an end user deal has to be ratified before meaningful exchange of high tech equipment can takes place. But not everyone is happy about the foundation agreements as they fear this will make India dependent on the US. It will also gradually ensure that the Russian systems will be replaced as they are not designed for inter operability with American weapons and communication networks. It is ironic that a few decades ago the idea of India and US militaries working together was almost unthinkable. Indian scientific organizations were under US sanctions for nuclear tests conducted in 1974 and 1998. America’s friend in the region was Pakistan and India seen as a camp follower of the former Soviet Union. US interest in helping India upgrade its defence capabilities is closely related to Washington’s desire to balance China growing profile in the Asia Pacific and Indian Ocean region, now renamed as Indo-Pacific by the Trump Administration. As another large Asian country, India was a natural choice for the US… While Donald Trump is taking the India-US relations further than any other US President, the process started with George W. Bush. Many of Bush’s top advisers were the new conservatives or neocons, who saw a rising China as a major challenge to US hegemony. Helping India to build its military capabilities and modernize its forces to partner America in the Pacific was their idea. Though former President Bill Clinton had already begun warming up to India, it was George Bush, with his offer of the India-US civil nuclear deal who made a paradigm shift in ties. America did some heavy lifting to get the pact approved in the Nuclear Suppliers Group. After Bush, Barak Obama continued the overtures to India. He too saw China as a threat and began the policy of America’s pivot to Asia, where China was taking a tough stand on the South China Sea and reinforcing and building up its islands in the Pacific. The UPA government, more so defence minister AK Antony cautious approach ensured that military ties did not progress at the pace that the US wanted. He was sluggish and kept major issues pending. The NDA government of Prime Minister Narendra Modi was much more pro active and keen to follow up on defence ties. Donald Trump is doing much more, openly wooing India, pleasing New Delhi by publicly chastising Pakistan. During Modi’s visit to the US in June 2017 for his first meeting with Donald Trump, India was designated as a “major defence partner’’ of the US. Washington is now moving quickly to bring India into its fold and gain both strategic and commercial advantage. Last month Commerce Secretary Wilbur Ross announced that the US would soon be lifting export controls for high technology product sales to India. This was something Delhi had for years wanted from Washington. Once the measures kick in, India will have access to defence equipment, which US gives to its NATO allies like Japan, South Korea and Australia. By placing India in the Strategic Trade Authorisation-1 list of countries, the US hopes India will be persuaded to buy more arms from America which will also benefit US manufacturers. Washington hopes eventually replace Moscow as India’s main supplier of military hardware. At last Thursday’s meeting it was also decided that that in addition to the annual Malabar exercises between India-US and Japan, a new tri-service exercise would be started. In keeping with the growing co operation in maritime security, the US Naval Central Command and the Indian Navy would begin regular exchanges to underscore maritime co operation in the western Indian Ocean. A hot line between the defence and foreign ministers will also be set up for frequent consultations. India and US security interests overlap on expanding their presence in the Indian Ocean, where Chinese submarines and carriers have begun to regularly frequent. Freedom of movement in the Indo-Pacific is a term to convey to China that it cannot dominate the global waters. 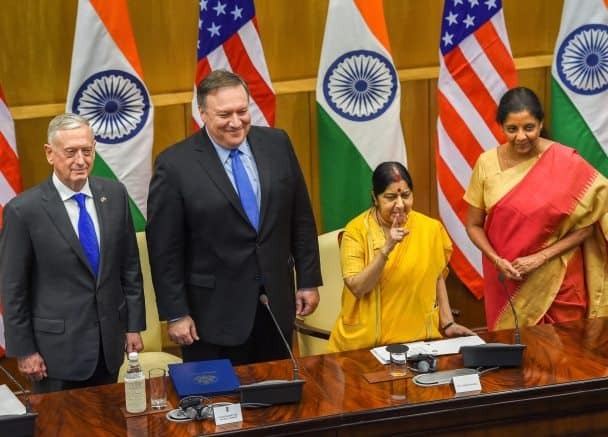 `We see the Indo-Pacific as a free, open and inclusive concept, with ASEAN centrality at the core and defined by a common rules-based order that both our countries are pursuing,’’ Swaraj said in her opening remarks after the dialogue, where all four leaders spoke to journalists but refused to take questions, Pompeo again stressed on freedom of navigation. Both countries are wary of China’s maritime expansion in the Indian Ocean. 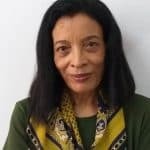 Apart from a naval base in Djibouti, in the Horn of Africa, China has access to the Humbantota and Colombo ports in Sri Lanka, and is building the Kyauk Pyu, deep-water port in Myanmar’s Rakhine state. The Gwadar port in Pakistan’s Balochistan province is at the centre of President Xi Jinping’s belt and road initiative. India is concerned at China overwhelming presence in the Indian Ocean and welcomes US presence and co operation in an area of strategic interest to Delhi. The US on its part is keen to have India shoulder some responsibility in patrolling the South China Sea and the overall Indo Pacific. However India so far has not given the green signal for such a move. Yet there are differences over Iran and Russia between the two sides. India has stayed firm on buying the S-400 missile defence system from Moscow, despite Washington’s efforts to scuttle it. Iran is again a grey area. While Delhi will agree to reduce oil imports, it is hoping that Washington will allow the Chabahar project in Iran to go ahead. As big power equations are changing, will India and US be the new allies of the future? Is India ready to play ball with Washington and move into its sphere of influence? While going ahead with defence ties with US, India is also trying to improve ties with China. The Wuhan informal summit between Modi and Xi has helped to improve ties. India is also a part of the China led Shanghai Cooperation Organisation. Brazil, Russia, India, China and South Africa (BRICS) is a forum of new emerging economies. Besides there is a Russia, India, China grouping which meets regularly. India is in a good position at the moment and keeping its feet on both camps.